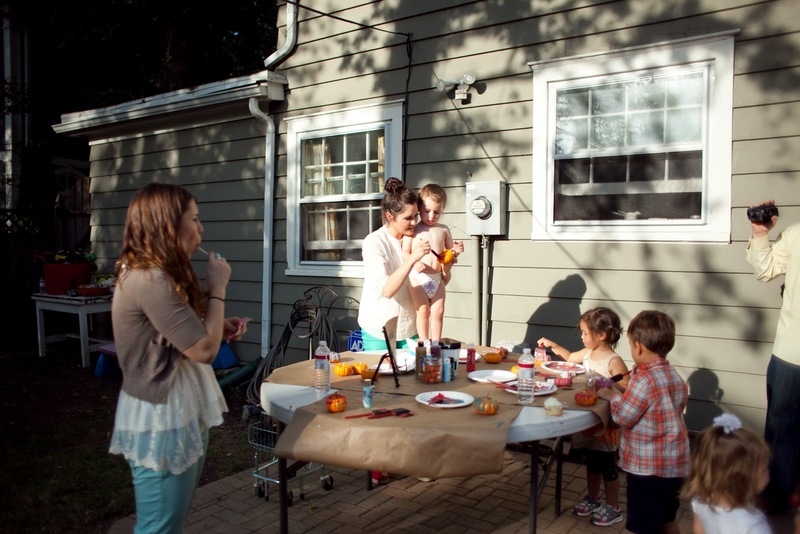 from the nato's: fall festival party! 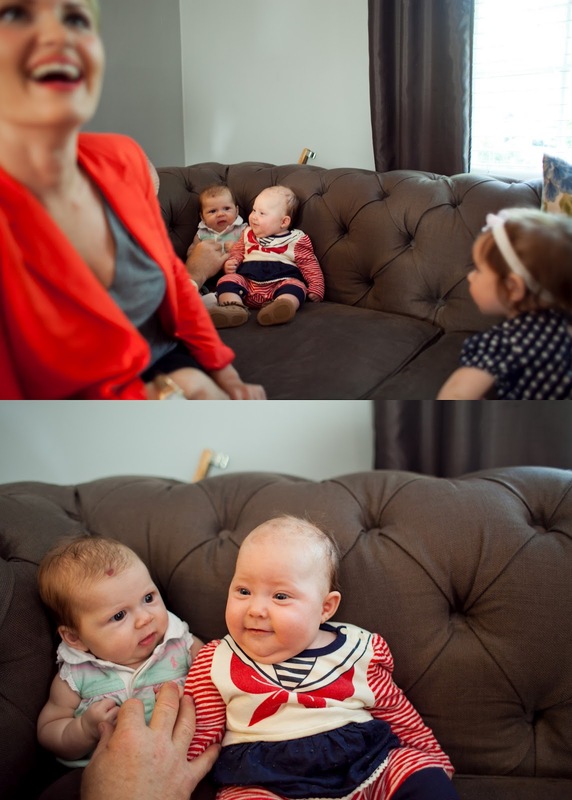 my sister, audrey, and i have the uncanny ability to make children a couple of days apart from each other. thus, we enjoy the "double party" often. you may have noticed. why not do double parties while your kids are young and have no say in the matter? it's cost efficient and less stressful when you have a sibling (who is also a hermit) to carry the load of extraverting oneself with you. 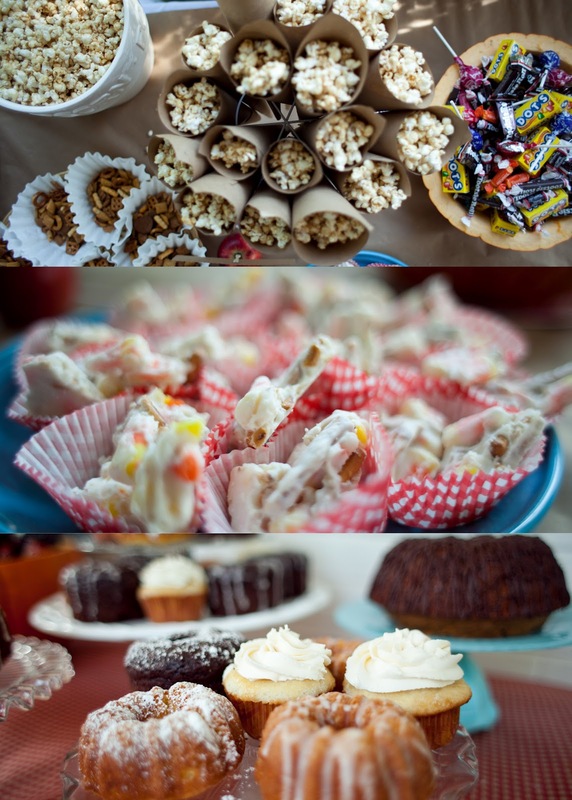 first off, this day was actually a triple party because i threw my husband a birthday brunch. why did i do both parties on the same day? because i'm a dumb-dumb. aren't these little whisky's the cutest? 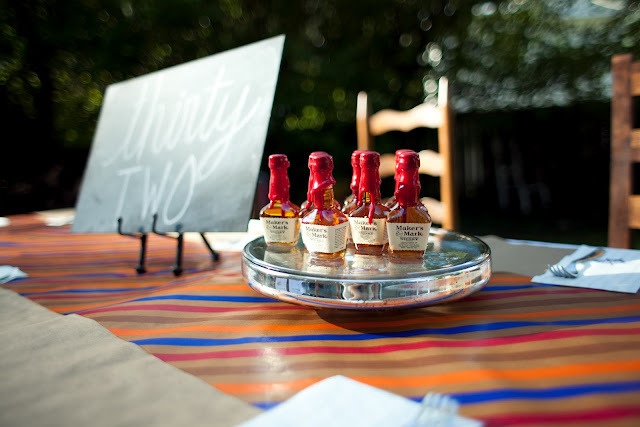 even grown men like party favors. moving on! let us enjoy the goodness of fall as june turns 1 and lila turns 4. it's hard to believe that these 2 are cousins, as they look nothing alike. but i have come to terms with the fact that i don't even look like my family, so this is neither here nor there. or some cliché like that. so we made all sorts of fallish foods. let's all take a moment to acknowledge that bundt cakes are kind of hard to make because you can't get them out of the dang pans unless you basically grease and flour them 12 times. we learned that after our first set bombed. some will say this is common knowledge found on the interwebs, and to that i say, no one asked you for your opinion. mkay? so when you have to chisel the cake out of the pan because it won't come out, and you feel bad for wasting your time and money, a resourceful gal will say...don't throw it away, we'll make little trifles! and i don't want to toot my own horn, but that resourceful gal is me. cake crumbles, icing, cake crumbles, icing. boom. let me just toot audrey's horn too. 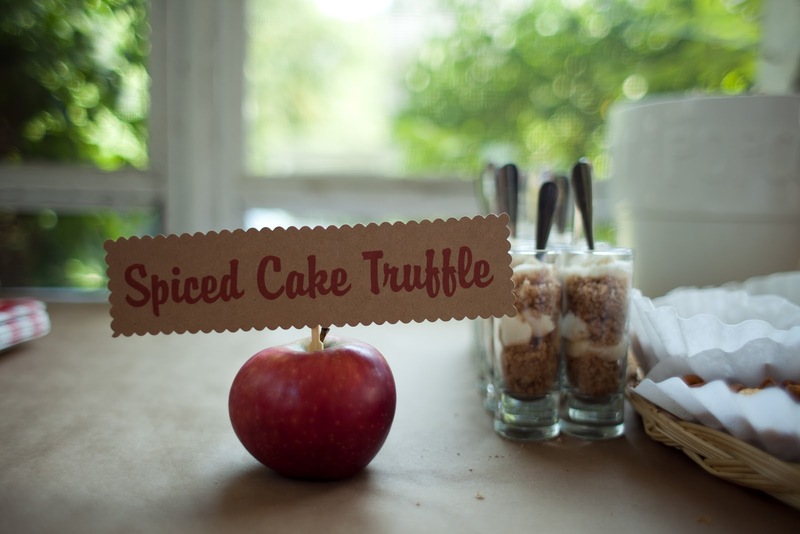 how cute is the signage put into an apple? yes, that was a last minute addition too. you should know that all of our parties are jimmy rigged. not pictured are the classy corn dogs. drinks in a pumpkin, anyone? well that's the only way i drink my coke's in the fall. 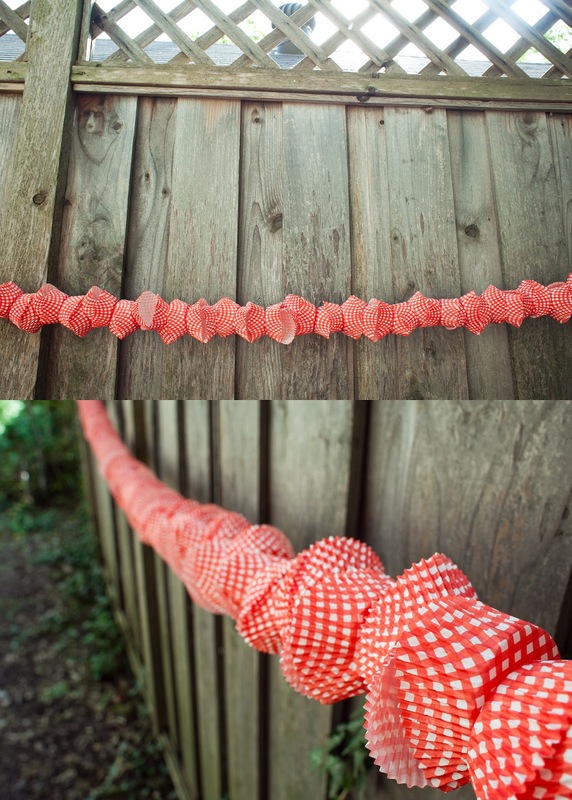 audrey made cupcake liner garland by simply threading sewing string through each one. painstakingly at midnight the night before. oh, hey june. isn't that a song? no, that's wrong. anyway...why are you eating dirt and your mother doesn't care? oh, it's because she's throwing a party. carry on. look at these two chunks. just look at them. wrist rolls and double chins. it's only cute when you're young, ladies. rock it while you can. ok let's move on. party games. it's a fall festival so you'll need tickets. luckily, no one really actually cared about the tickets and just did what they wanted. that's ok. i don't care about rules either. 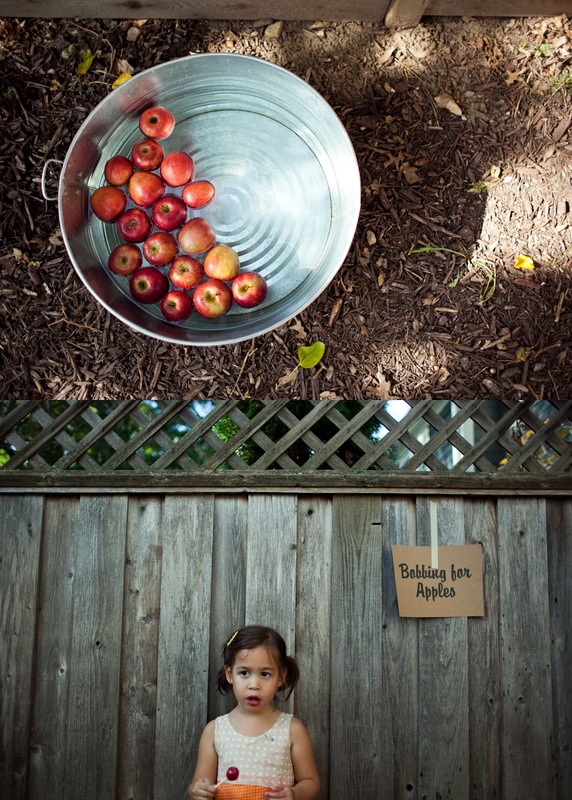 as you can see here, lila is ecstatic about bobbing for apples. happy birthday, child! the game was a big hit with the kids. surprisingly. i kind of thought no one would play it. but they were actually really die-hard competitive. people cried. it was very sanitary, i'll tell you that much. there was a ball toss as well that maybe 2 people did. it was a big hit for those people that tried it. 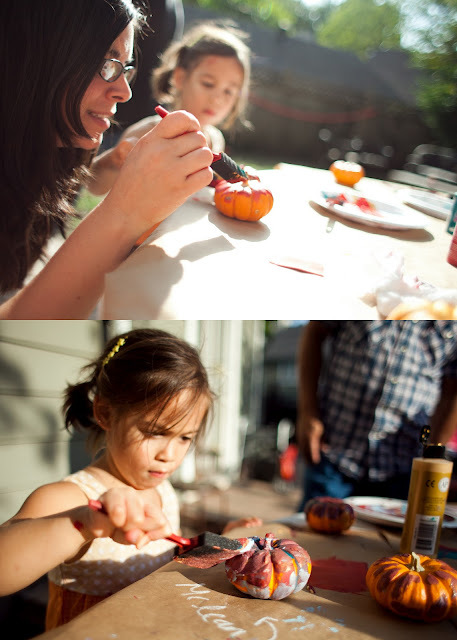 we did some pumpkin painting. and by that i mean, some kids painted pumpkins and then lila repainted all of them with gobs and gobs of paint that will dry in 2 years. i think they call it "curating". 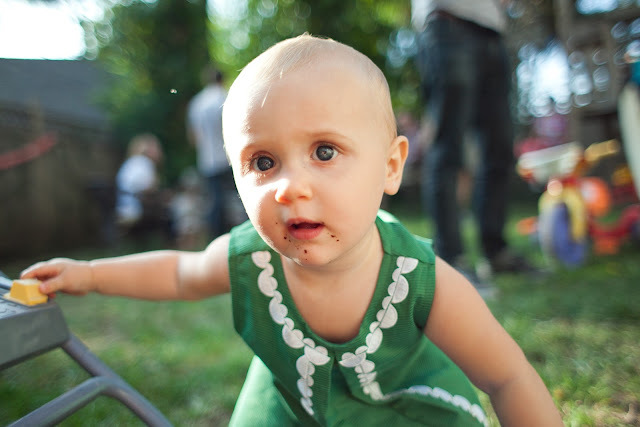 june was just living life as a lone orphan in the woods, eating whatever was thrown to her by merciful passersby. 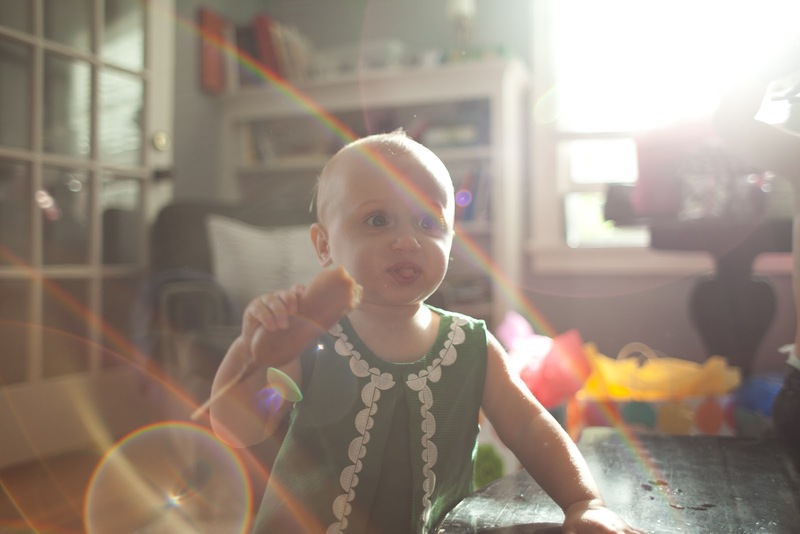 as she was eating the corn dog, a double rainbow appeared. like her mother, she loves these eyelids and pig tongues wrapped in a breaded product because they produce a happy drug-like feeling. i choose to say no to this satanic experience. because real meat is out there, people. it's out there. basically, if you look at this picture below, you'll agree with me that we're a classy family. 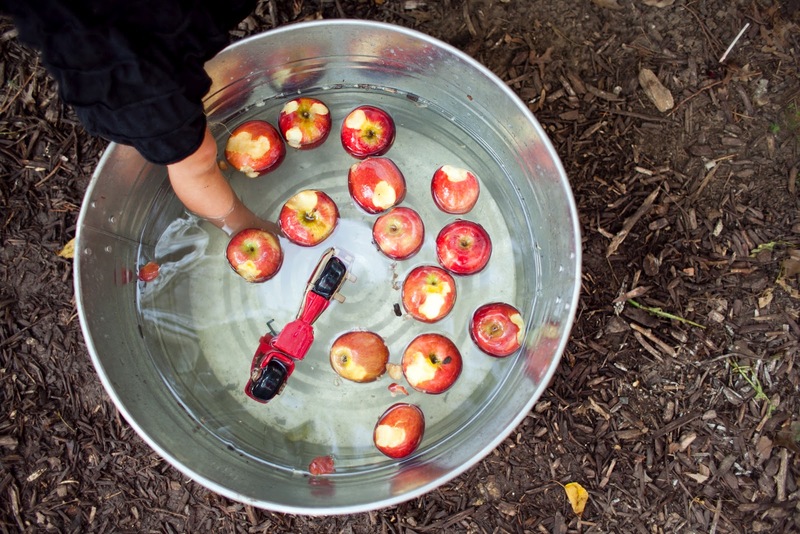 at the end of the day, everyone got sick from bobbing/eating/snotting/foot bathing in the bucket of apples. 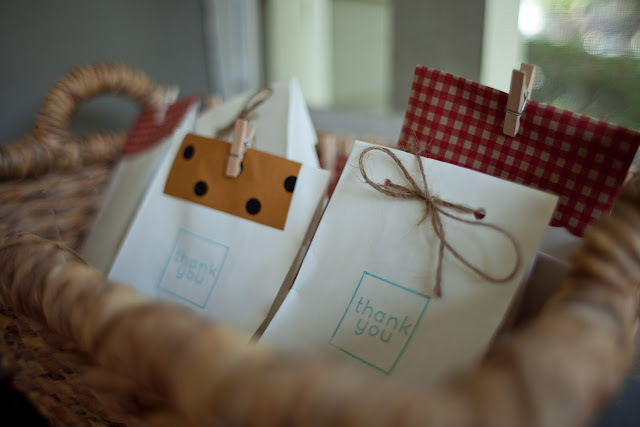 on that note, don't forget your party favors! they are filled with emergen-c, since you're kids are for sure going to have a cold. happy birthday, june and lila! Wow! What a fun party. But the best was your wry commentary with each picture. My laugh of the day.=) Thanks! as always, i'm left either laughing or crying after reading a post from you. this time laughing. 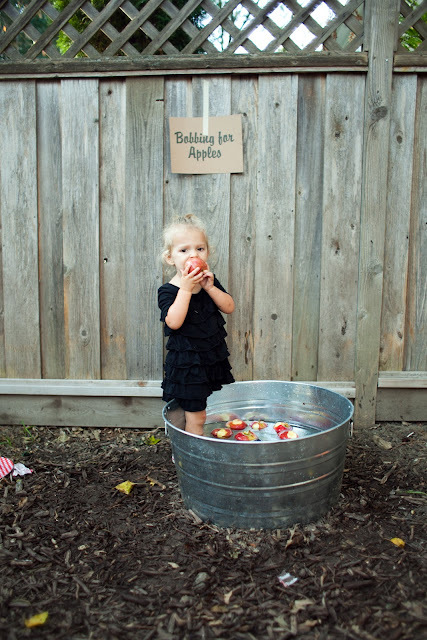 why did it never occur to my parents that bobbing for apples is entirely unsanitary?! so gross. but yet my daughter requested it at her party this year. separate bowls for everyone???? very cute. happy birthday to some beautiful little girls! My sister and I also have 3 kiddos 5 weeks apart. Hers are twins, so that is how that works. 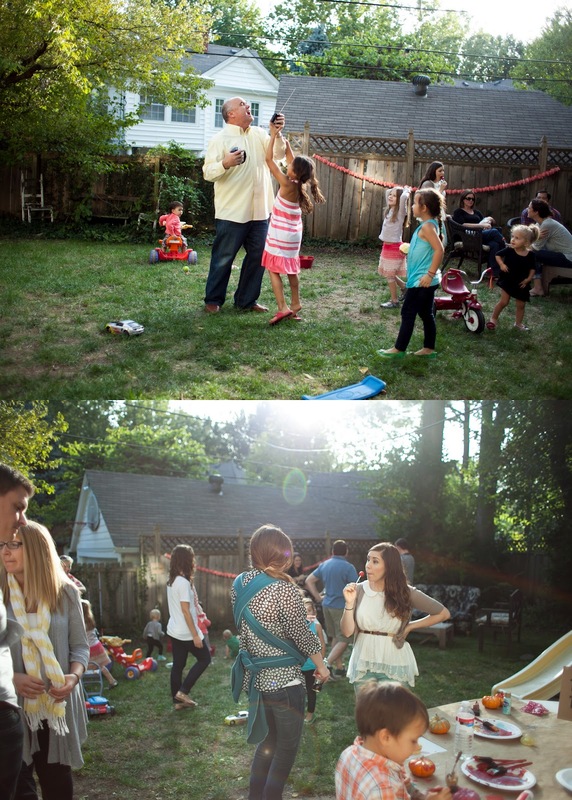 I feel like a blog stalker commenting on your posts all the time, but I have to say that your family celebrations look like a lot of fun (if I didn't seem like a stalker then, I am now). I love that you have old fashioned fun and I love the story telling that comes along with these priceless photos of yours. super cute party, germ swapping and all. Laughing so hard right now!! Love this! Just love it. Bless your hearts! Bahahaha! seriously made me laugh out loud. 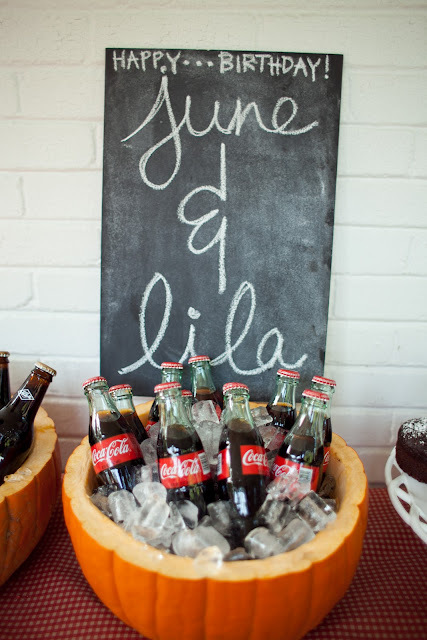 but i love the idea of pumpkins as ice coolers. cute. You absolutely crack me up. Sounds like a successful par-tay if ya ask me! Love the party! 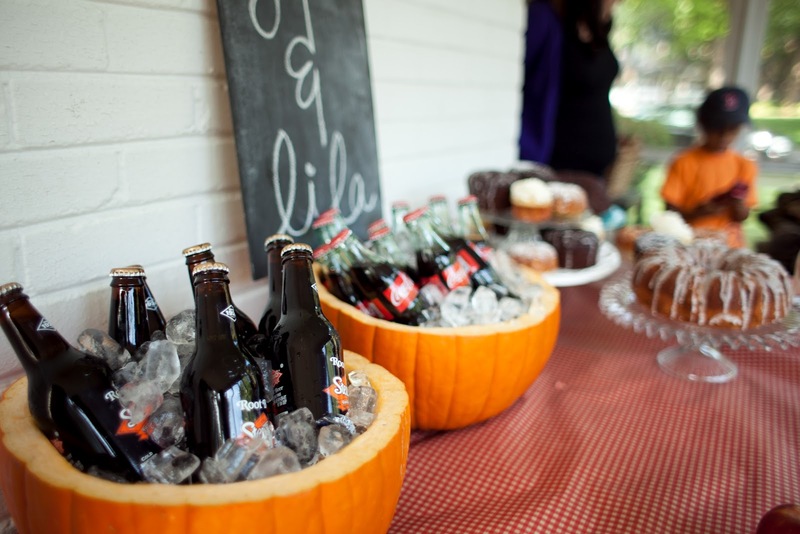 The drinks in the pumpkins are adorbes. As are Junie and Lila. Wish I could have been there! I just laughed out loud, like. 6 times. you are the most hilarious person I know.. no, met.. no... um, read about, that's it! what a creative party! I loved the drinks in the ice flled pumpkin...so autumn!!! happy birthdays! I will never eat a corn dog again. i was laughing through this whole post! You're hilarious, and this party is adorable. lovelovelove. and what cute kiddos! when i was twelve, i planned a fall party for my younger siblings and their weird homeschool friends. except i loved them all, and maybe was jealous of their homeschool sitch. anyways. i spent my $8 allowance and babysitting money on gobs of candy, a roll of orange streamers, and bright yellow poster board. i decorated our deck like it was my job, cuz it sorta was. i made cute signs, wore a costume and had cool games. the kids had a blast and i felt like the best big sister of all time. i did it every year after that. well, until i moved out and went a bit wild. but gosh, those fall parties. they got better and better, and i loved it more and more. and i miss those times. thanks for bringing those sweet memories back just now. love ya! 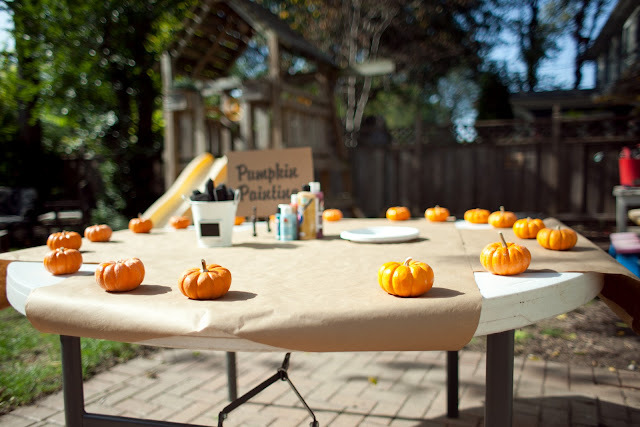 I love the fall party idea. We just threw my 3 year old an art party last weekend it was SO fun. I'm already on the prowl for the 4th Party "Theme" and now thanks to you, I don't need to visit Pinterest for the next 359 days. 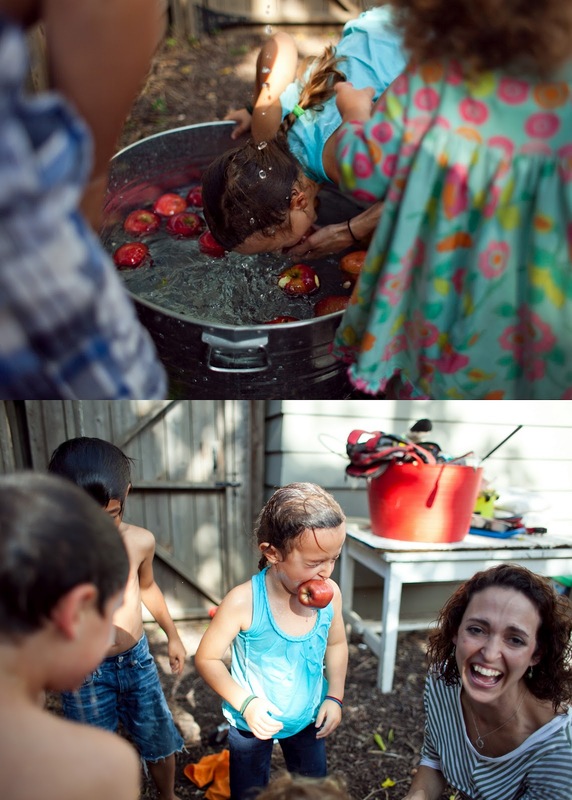 The bobbing totally grosses me out too...you are hilarious! Love the party and the post. I always love reading everything you write. FYI - from one baker to another (see what I did there...) use the Wilton Cake Release for the bundt pans. That stuff is ah-maz-ing! The heavens will open up and angels will sing. Except maybe the ingredients won't be good for your Lila. Sadly I'm not even sure what they are. hahahahahahaha! i'm right with you on that one! 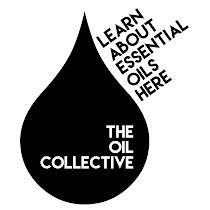 my kids only get the soy version...as if that's much better! Hahaha!Reading about your apple bobbing reminded me of a game I played when I was young. Now that I think of it it was absolutely disgusting. 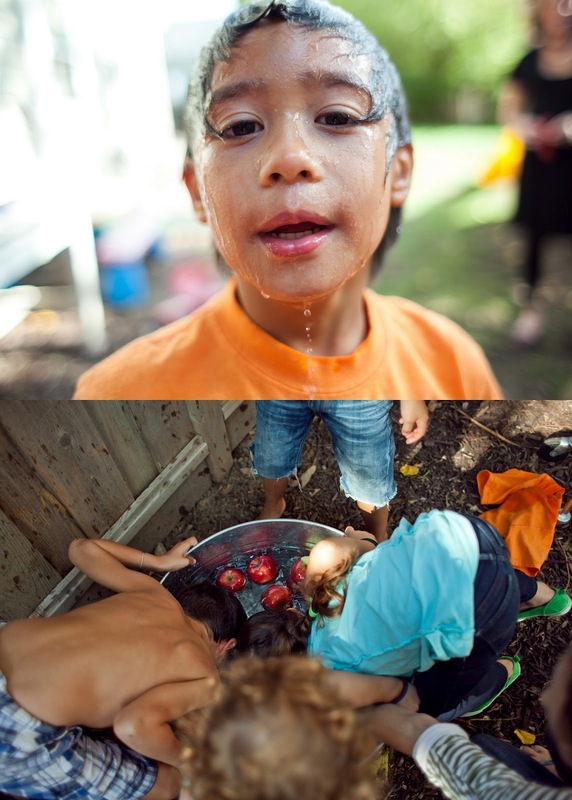 We had to get buttons out of a bowl full of water using our tongue. hello amazey party! looks fantastic--and love all the lil details. You are hilarious! Okay, so maybe I am about to comment twice? If so, please delete this one! 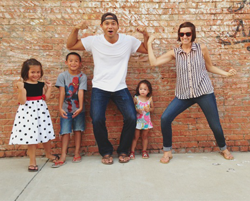 I have a been a blogstalker for a while, and love the truth you speak about our calling as mothers and wives. Just yesterday my own mother spoke some very meaningful words to me..."find grace in the small interruptions." 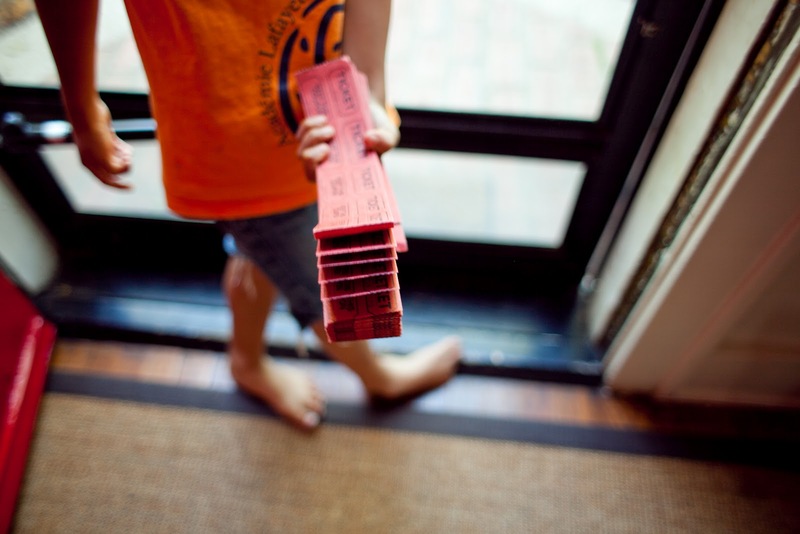 The book readings, the nap-fighting children, the kids who want you to play one more card game. May we both find grace! 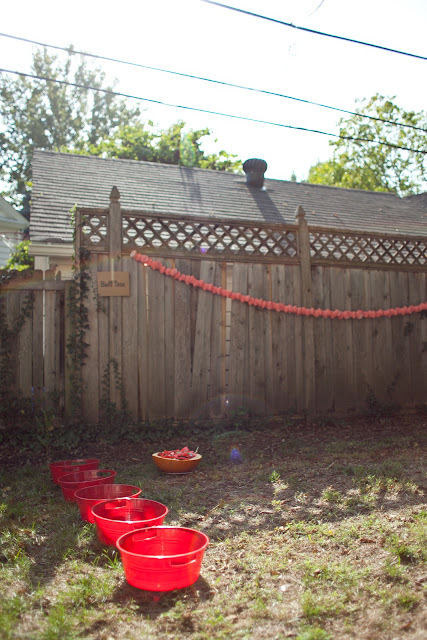 Good old fashioned backyard parties are so fun!